I was invited to produce and co-direct development of a pre-school series concept, Boy & the Dinosaur for 1461 Ltd. 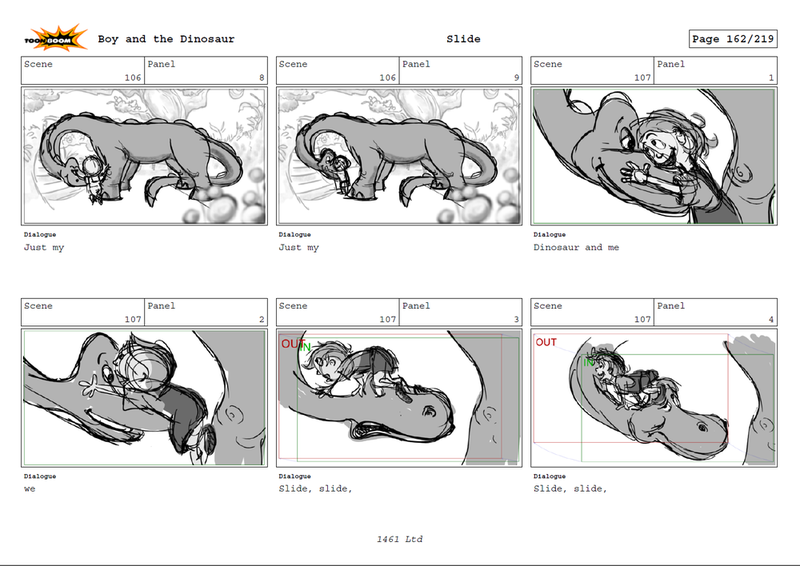 These storyboard for the promo song were designed for the audience to feel part of the ride, sliding with Boy down Dinosaur's back, took full advantage of the cinematic staging possible in CG. And here's the same sequence realised in full CG animation. It was an amazing experience guiding these boards though layout to post production and a treat to help shape this very special TV series concept with an incredible team of artists. Boy and the Dinosaur was one of the Top 3 screened titles at MIP Junior. The song is written and performed by James Dever, co-directed by myself and stop motion supremo Paul Couvella, animated by Matthew Stephenson, with CG services by Studio Distract. Edited by Jane Hicks with sound Design by the Ditial Audio Co. Executive Produced by Russell Dever. Dinosaur thinking, and getting an idea, with his tail.